ActualTech Media Announces Launch of "The Gorilla Guide™ to Modern Storage Strategies for SQL Server"
The Gorilla Guide helps readers better understand the storage needs around SQL Server as well as how best to modernize the SQL Server environment and provide it with comprehensive business continuity and disaster recovery capabilities. Armed with the latest implementation data from the field, authors and vExperts David Klee and James Green walk readers through the most challenging aspects of aligning storage infrastructure with the unique needs of Microsoft SQL Server. "Microsoft SQL Server is an increasingly critical component of an organization’s information architecture," explains Green, "but people are still struggling with how to best provide a comprehensive storage foundation with sufficient I/O to meet operational database and reporting demands. The Gorilla Guide helps readers better understand the storage needs around SQL Server as well as how best to modernize the SQL Server environment and provide it with comprehensive business continuity and disaster recovery capabilities." Additionally, substantial portions of the book are dedicated to exploring the performance requirements around SQL Server as well as how powerful data reduction features, such as compression and deduplication – must be carefully considered in these environments. These use cases include Virtual Desktop Infrastructure (VDI), remote office or branch office (ROBO), tier 1 and dedicated application support, data center consolidation, as well as test and development environments. 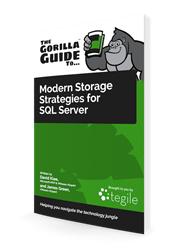 Significantly, the Gorilla Guide also covers potential storage-induced SQL Server licensing savings, which can help organizations reduce their database expenses. Further, readers are treated to a chapter focused solely on storage best practices as they pertain to SQL Server. ActualTech Media provides enterprise IT decision makers with the information they need to make informed, strategic decisions as they modernize and optimize their IT operations. Leading 3rd party IT industry influencers Scott D. Lowe, David M. Davis and special technical partners cover hot topics from the software-defined data center to hyperconvergence to storage and virtualization. Cutting through the hype, noise and claims around new data center technologies isn’t easy, but ActualTech Media helps find the signal in the noise. Analysis, authorship and events produced by ActualTech Media provide an essential piece of the technology evaluation puzzle.